Although salt is commonly applied to clear roadways of winter contaiminents, in some situations they are are not effective. These situations include those where the temperature drops below their operating range, and when the snow is extremely compact or when ice forms. In the latter situation, even conventional mechanical removal methods can be ineffective, and other methods such as sanding are often employed. 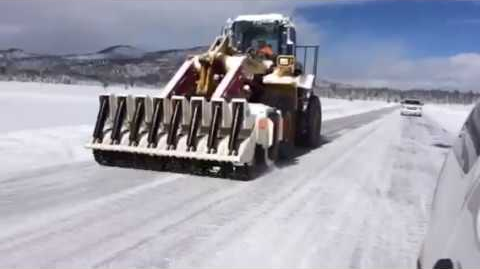 Recently, an alternative mechanical technology has been developed which can be used to remove compacted snow and ice in these situations. The iTSS Lab at the University of Waterloo is currently field testing this technology in partnership with the Ministry of Transportation (Ontario). The research focuses on evaluating its performance and cost effectiveness as well as determining best practices surrounding the use of this new technology. This research will identify the situations where this technology is best suited, and address potential concerns from its use, such as pavement damage.